Universal Pictures has released a new poster for The Grinch, while revealing that the second trailer will be released tomorrow. 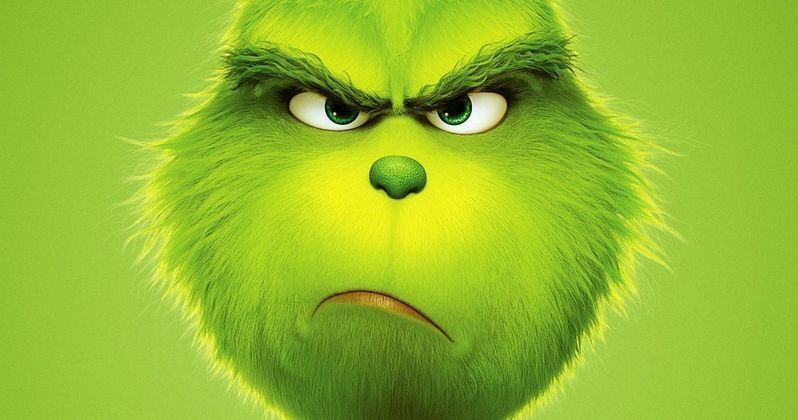 The poster introduces fans to the concept of the "Resting Grinch Face," while the studio has also released a brief new video on The Grinch Twitter. The video encourages fans to tag their friends who often put their resting grinch face (#RGF) on display. The video also features a few bits of new footage, including a tiny scene where The Grinch seemingly reacts to people tagging their friends with #RGF, stating, "That's hurtful." The first trailer was released back in March, and if Universal and Illumination keep following the same pattern of releasing a trailer every three months, we could get a third and/or final trailer in September, to get fans ready for the November 8 release. The first trailer offered a glimpse at The Grinch's (Benedict Cumberbatch) solitary life, which he lives inside a cave on Mt. Crumpet with his faithful dog Max, who has been trained to attend to all of Grinch's daily needs, with the help of some innovative inventions. The first trailer also showcased some of his rare interactions with his neighbors in Whoville, whom he only encounters when he runs out of food. The Grinch's peaceful grumpiness is interrupted every year at Christmas by the Who's in Whoville with their annual holiday celebration, but once The Grinch gets word that this coming celebration will be three times bigger than usual, The Grinch embarks on a plan to steal Christmas, deciding to dress up as Santa Claus himself, but he runs into some complications from a young Whoville girl named Cindy-Lou Who, who has a plan of her own, albeit a much more kind-hearted one. Cindy-Lou and her friends plan on "trapping" Santa Claus so she can properly thank him for her overworked single mother. This plan ends up clashing with the Grinch's as Christmas Eve approaches. It's worth noting that the full voice cast hasn't been announced, and the first trailer didn't feature Cindy-Lou Who or any of the other main supporting characters, so it's possible they'll be revealed in this trailer dropping sometime tomorrow. This movie represents the eighth fully animated feature from Illumination Entertainment and Universal Pictures, which is described as, "funny, heartwarming, and visually stunning, it's a universal story about the spirit of Christmas and the indomitable power of optimism." The Grinch is directed by Yarow Cheney and Scott Mosier, who have both taken intriguing paths to their directing careers. Cheney served as a character designer on Illumination's The Lorax and was also the production designer on that film and other Illumination hits such as Despicable Me and Despicable Me 2. Scott Mosier is best known for producing most of director Kevin Smith's early indie films, who makes his feature directorial debut here. Cheney served as a co-director on Illumination's 2016 hit The Secret Life of Pets as well. Take a look at the poster and this brief video from The Grinch Movie Twitter, and check back tomorrow for the new trailer.